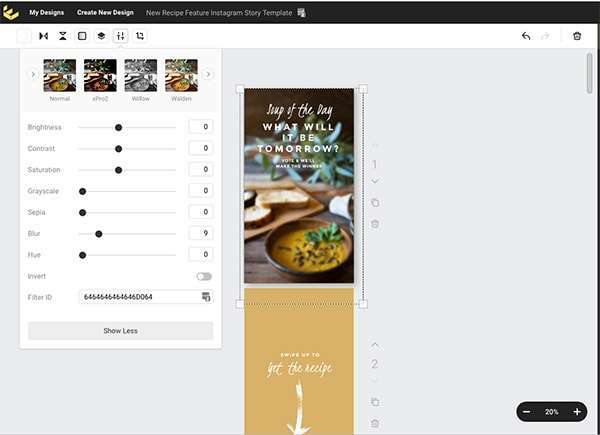 Instagram Story Templates are a must-have these days for busy brands and bloggers – and we have 5 sets of Easil Instagram Story Templates to save you time – and have you looking like a pro – when planning your Stories ahead of time! With Instagram growing massively, Instagram Stories that foster engagement are a key part of any social media strategy moving forward. 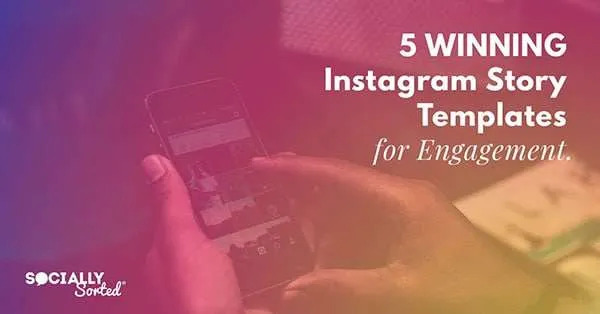 In this post we break down 5 key types of Instagram Story Templates that do just that (with examples!). 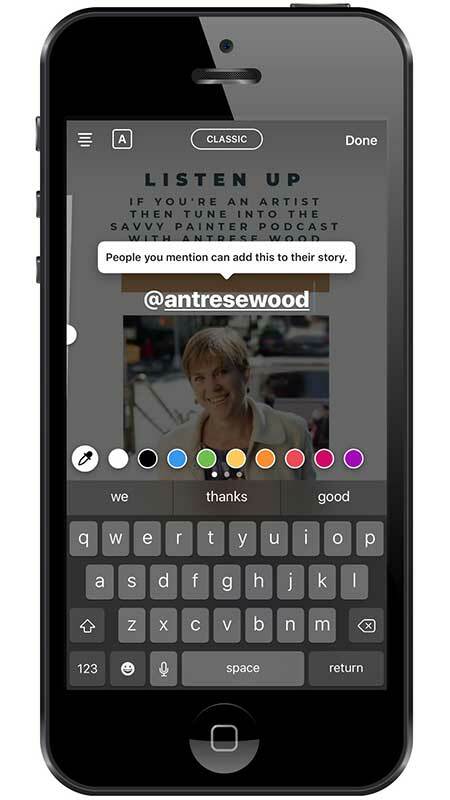 Why Instagram Stories and Why Instagram Story Templates? More than 1/3 of Instagram users are using Instagram Stories on a consistent basis. With over 1 billion active monthly users (say whaaaaaat?) on Instagram, the numbers rack up pretty quickly! Instagram Stories is adding a lot of hours to our “use time” on Instagram. Instagram said so! More than 70% of Instagram Stories are actually watched with the sound on. Now consider Facebook – where approximately 85% of users watch videos with the sound off – and you can start to see why Instagram is considered a great platform for engagement! 1/3 of the most viewed stories actually come from businesses. In fact 80% of users follow a business on Instagram which is great news for us as business owners. Bottom line? Businesses, bloggers and brands are on Instagram Stories. So it’s a great opportunity … and if you want to save time creating content for Instagram Stories, then Instagram Story Templates are a great way to go. There’s one thing to remember as we work through this post. Instagram loves engagement. clicking through to a profile or tag mention. And of course there’s Instagram Story views. These actions are similar to the reach, likes, and comments you see on any platform. It’s the engagement with your Instagram Story that counts. So when I talk about Instagram Story Templates, there are of course many that you can choose from. But we’re going to focus on those that encourage engagement in this post, OK? Now that Instagram Stories are popular, so are Instagram Story Templates. They pop up everywhere when you do a search on line. Many of the templates are branded in sets, and are very pretty, but often you need to use Photoshop or similar tools to edit them. Which renders them useless for the average Joe business owner. Easil is my go-to, easy-to-use DIY Graphic Design tool. It allows you to quickly and easily edit the templates in a way that results in designs so good you’d think a Pro designed them. In fact, I love the tool so much that I recently decided to join their team in a Chief Storyteller role. 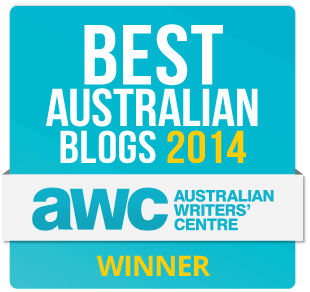 It makes sense – I’m talking about Easil all the time anyway! You can find out more about Easil here. And you can sign up for a free account here (my community can access 30 days on Plus level, gifted. Woot!). 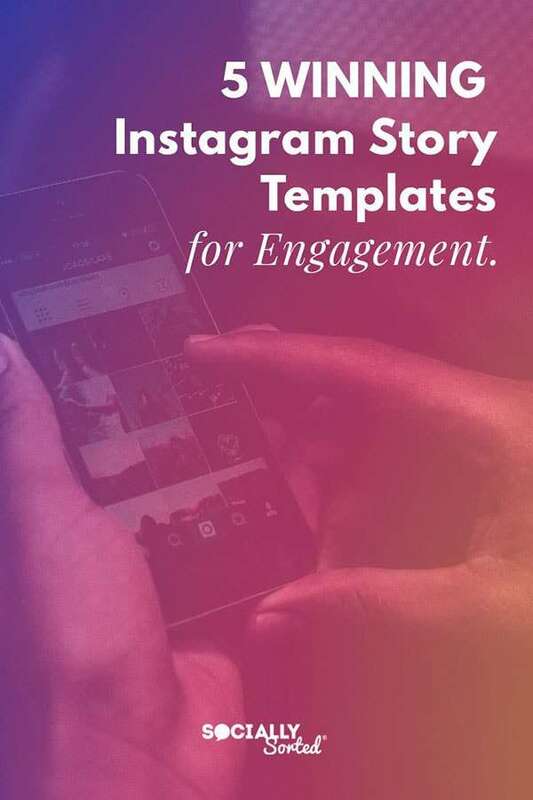 Here are my top picks for Easil Instagram Story Templates to attract engagement for your Stories, in no particular order. One of the ways you can encourage engagement on Instagram Stories is to feature other users or brands. Here’s an example of an awesome template for featuring a person or public figure or team member from a brand… even a client! Many of the Easil Instagram Story Templates give you a number of screens to choose from, so you can use just the ones you need or all of them. Use Easils Feature Artist Template to give a Shout Out! And in a few clicks, I was able to transform these templates to customize them and feature my friend, talented artist Antrese Wood. Notice how I’ve left a space with a gold section/bar on the final panel? Now, when I upload the Instagram Story templates into Instagram Stories, I can easily tag Antrese in my story. All I need to do is place the text/tag over that bar to highlight it. It’s easy to tag. Just follow the directions below to tag another Instagram user. 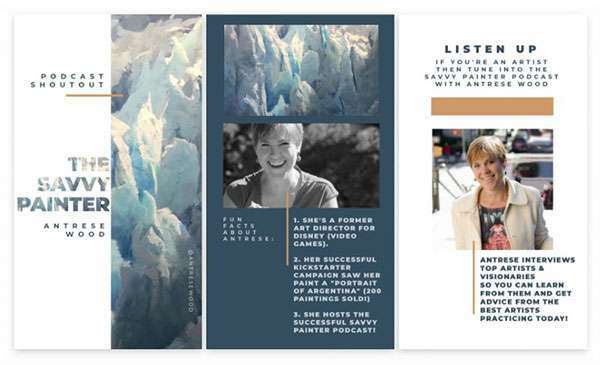 I could tag Antrese’s public profile account as an artist or her Savvy Painter podcast account on Instagram… or both. Use the typing tool in Instagram Stories to type the @symbol on your story. Instagram will suggest related account names that match your search. 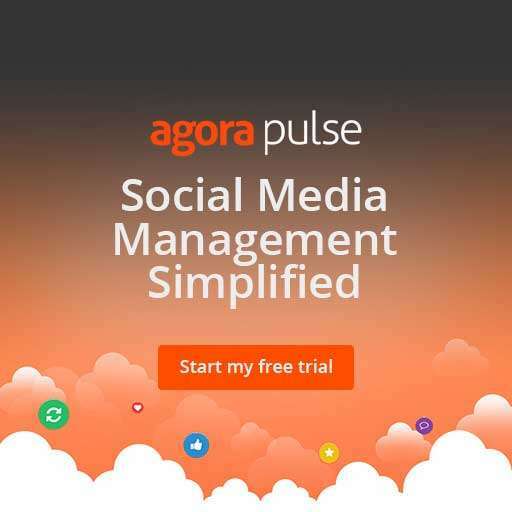 Choose the account for the person or brand you are looking for and click on it – this will make the link “live”. Finish your story and post it. By doing this, Antrese will see the story and is more likely to engage. 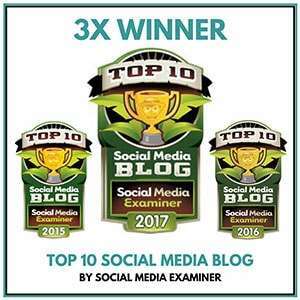 She is also given the option to share my story in her story, so it’s an easy win for her in terms of content she can create and share in just a few clicks! Also, my followers can easily engage too, clicking through to her profile on my recommendation. It all adds up to engagement. 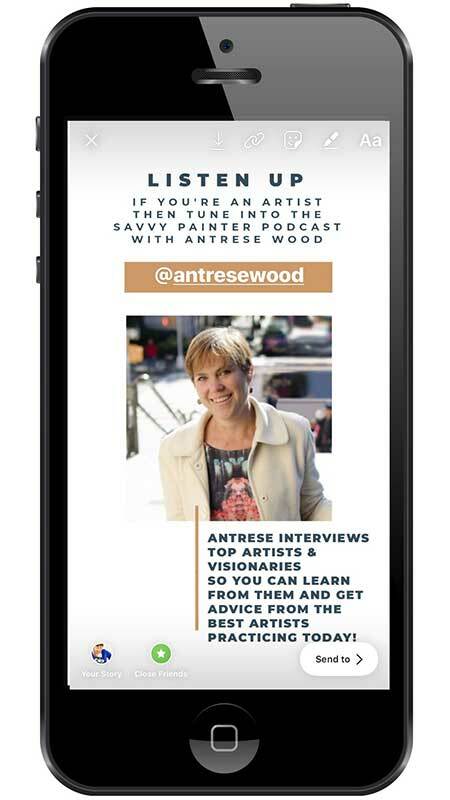 Oh, and if you are an artist or you know an artist, then please spread the word about Antrese’s podcast – it’s wildly successful and artists love it! Instagram Story Highlights are an exciting feature of Instagram Stories. They let you combine multiple Instagram Stories into a playlist or album of content for your followers to watch at their leisure. In this era of Netflix and binge-watching, it’s a smart move to organise your stories into playlists. You will see Story Highlight icons on many Instagram Accounts. Here are the icons on my Socially Sorted Instagram account (see the blue circles below my profile?). You can toggle your settings to save all of your stories into an archive within Instagram. This makes it easy to access them later and add them to a playlist. I played around with various shapes and styles to create my icons, and used Easil’s Instagram Story templates for Highlights to help me. 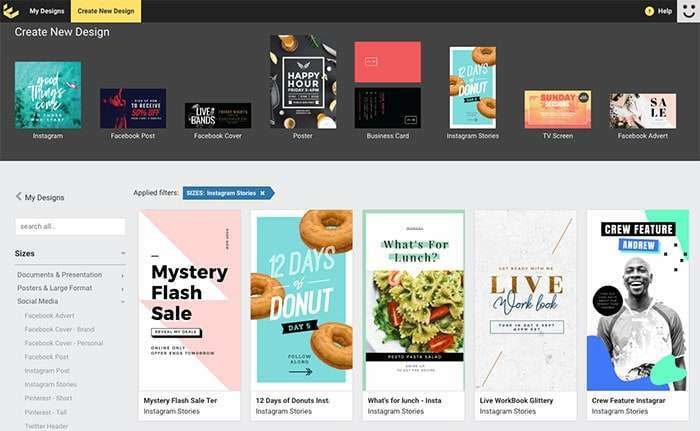 Just choose the Instagram Story templates in Easil and you’ll see Icon templates featured many times throughout their designs. Find an icon set, then adapt it for your brand. You can change out the icons and background colors in any way you choose. Can’t find what you need in Easil? You can find many icon sets of your own online. Once you find a set you like, download it (usually for free, but check licence usage and cost before you proceed). Then upload them into Easil and add them to your Instagram Story Templates to create cover images for your highlights. And if you want to watch my Instagram Story highlights you can start with my Office Pals here and my blog here. If you’ve been hanging out on Instagram Stories for a while you may have noticed This or That Templates. 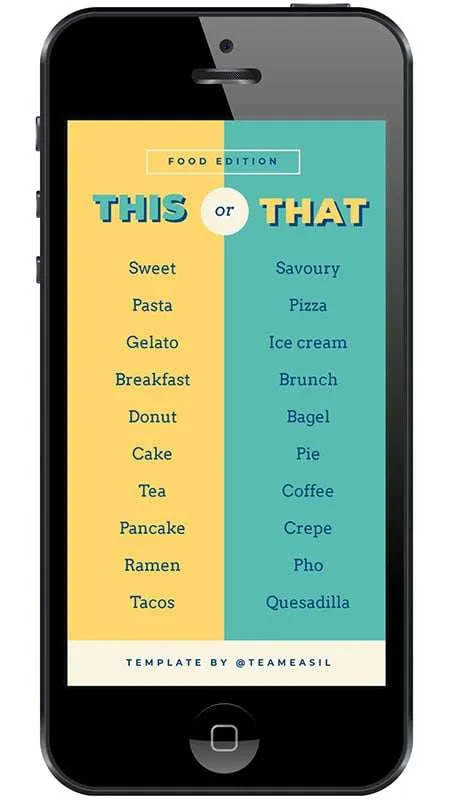 The idea is that you post one of these templates, and make your choices by circling or highlighting the answer with Instagram’s drawing tools. Then you share the completed version with your audience and perhaps a fresh copy of the template so they can do their own and screenshot them back to you! The end result? A quick way of not only entertaining your audience and getting to know them (and them, you), but you also encourage engagement. You could ask your viewers to tag you or DM you with their responses for more engagement. 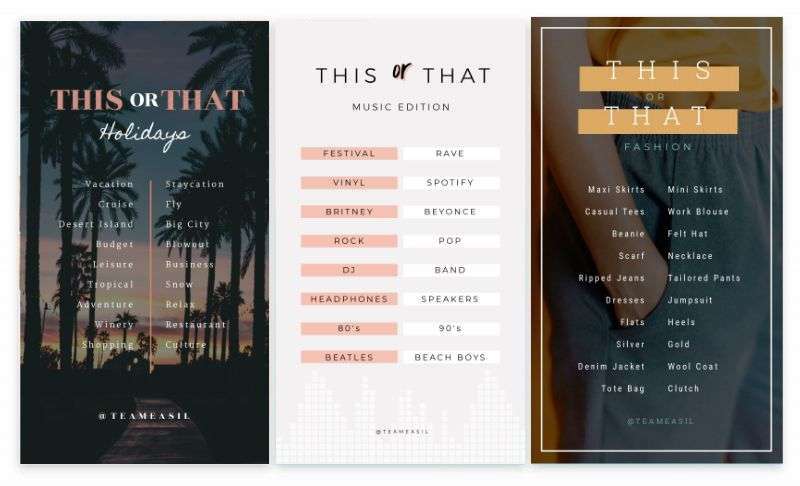 Instagram Story “This or That” posts don’t have to be about your specific industry or topic. Sometimes you can just have some fun! 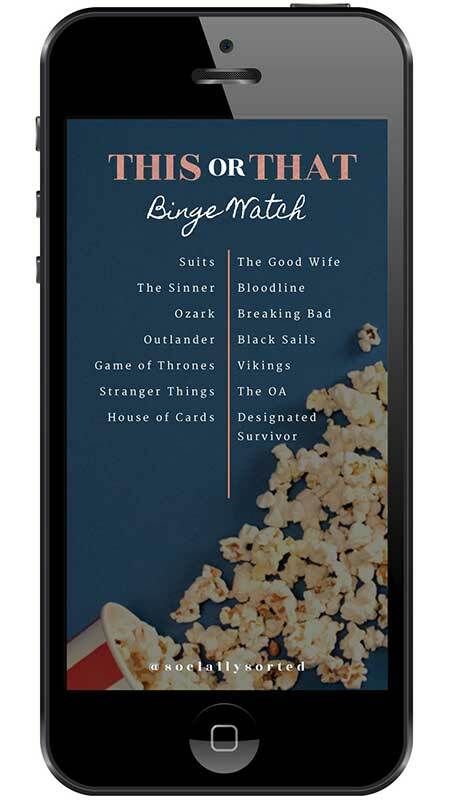 Although, I think if I was completely honest, it would challenge me to actually choose between some of the “this or that” options for TV shows to binge. You? Using Instagram Story templates can help you to create something custom and unique in minutes… if you stick to the design structure of the original design. In creating my custom designs from Easil’s Instagram Story Templates, I try to keep it simple and switch out a couple of elements, keeping to the original style of the design. Instead, I focus on directly replacing text, images or colors. Keep it simple. And remember: A designer created the template that way for a reason. So if we are not designers (me included) refrain from messing around with it too much! Instagram Polls are one of the best ways to send a message to Instagram that you’re audience is engaging with your content. 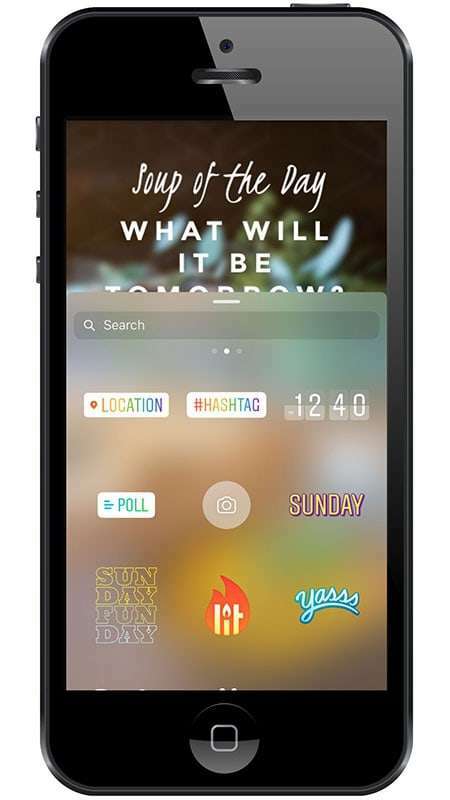 It’s easy to add a poll to your Instagram Story. But with the right template you can really make it pop! Then I converted it into an eye-catching Poll template ready to add my poll. In just a few clicks, I could change the headings, remove the sections I don’t need, and make space for the poll feature. This is the part I’ll add “live” in Instagram Stories. Note that I added a slight blur effect to the photos so that I can add the Poll over the background image in Instagram Stories. The template I used is actually a 2-page template, so I could also choose to add a “swipe up” screen if I wish to send people to a recipe or website (or edit it in any way I like). 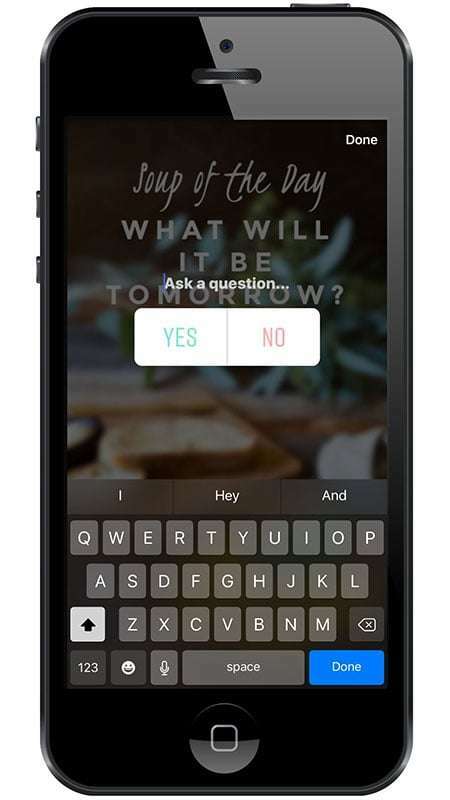 Then add customised text to your poll. As below, you’ll be prompted to add your question as well as the two “answers” that you want to give to people as the poll options. Get creative here… it doesn’t have to be a simple yes, no. You can add any words you like for the two choices. You can even use Emojis, like I have in the finished poll image below! As you can see, by using Instagram Story Templates for polls, can really make your poll stand out! If you are a restaurant or cafe, this is a great way to engage your followers – involve them in menu planning and ask their opinion! We can’t resist giving our opinion about food. Now, I’m hungry! Hot Tip: After you’ve gone to the effort of creating the template, use it again and again. If this was my cafe, I’d do a weekly poll about the soup of the day. Customers love to be involved week after week, especially if they are coming in to buy the soup! Is it worth a few minutes of your time, to change the text and add a new poll each Monday? You bet! We’ve covered off on a few ways to engage your followers with Instagram Story Templates. And really, most of the examples we’ve shown already have been “call to action” or CTA examples. 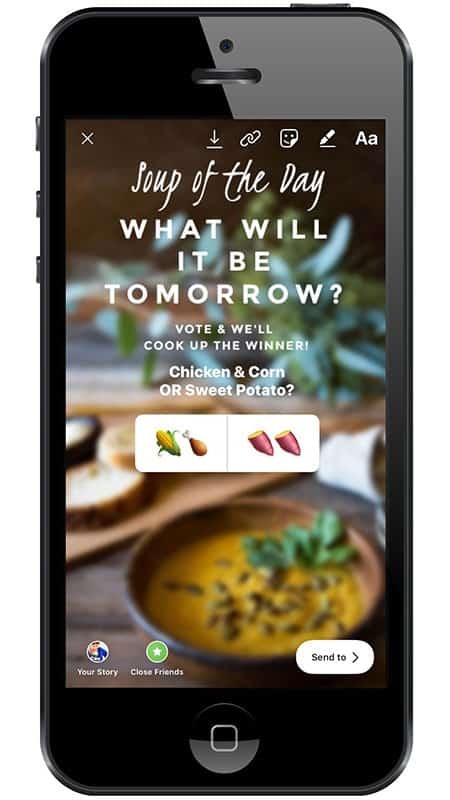 Polls, This or That, Tagging, Instagram Story Highlights – they are all examples of a way to use CTAs to engage your followers. So #5 is really a round up to give you some more examples of how you can use calls to action, specifically “Swipe Up” and “Direct Messages”. 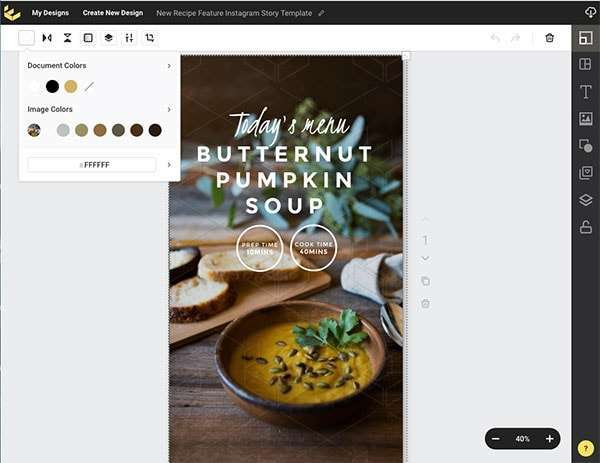 Whether it’s Swipe Up, See More, Check it Out, Shop Now… or to send a Direct Message… you can easily edit your CTA with Easil Instagram Story Templates. Most of them have the CTA ready to go, so all you need to do is edit the text to match the action you want them to take! Hot Tip: Swipe Up is currently only available for users with at least 10,000 followers or verified accounts, so if you don’t have it (yet) then encourage viewers to visit your link in bio. Are you using Instagram Stories? Would Easil Instagram Story Templates add some WOW to the Stories you are already creating? Let me know in the comments below. Oh and if you have any requests for templates, let me know. I’ll be sure to pass it along to Easil, but you can get started with creating your own here.